I'm sure there will be a few sore heads in N5 this morning. I personally went for jumping up and down madly as my choice of celebration rather than over doing it on alcoholic beverages, after all it is a school night. But doesn't it feel good? I know we've not won anything yet and there is still a testing 90 minutes of football ahead, but to get to Wembley is certainly an achievement. We certainly made though work of it last night. Though from the off I didn't think the question of us winning the tie was ever in any doubt. The team just seem to be focused on winning. The players had the bit between their teeth and went for it. Credit to Ipswich for turning up with a game plan which worked so well for 60 minutes. 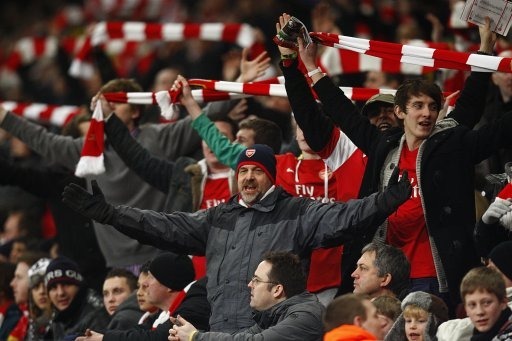 Their fans can be immensely proud of their team. We found ourselves up against a tricky opponent and had to throw everything at them in order to win the tie. Really we should have had the tie in our hands in the first half though. The amount of chances we created were certainly greater than the number we were able to muster at Portland Road. Robin van Persie was again unlucky when he saw an early header come cannoning off the bar after a good cross from Nicklas Bendtner on the right. Cesc Fabregas then had this shot saved after he was put through by Jack Wilshere. There were more half chances. Wilshere again the creator as he put through Fabregas with a pinpoint chip, which the Captain controlled with his right foot before dispatching a left foot shot in one movement. The attempted didn't trouble Marton Fulop in the Ipswich goal. Arsenal were creating chances but the visitors had ten men behind the ball. They played the same tactics as they did during the home leg, with five across midfield and a solid bank of four defenders behind. That left Tamas Priskin to hold up long balls on the halfway line when they were hoofed forward. As the half time break was approaching, Bendtner and Van Persie played pinball in the box as goal-bound efforts would smash from one defender to another. Nothing was made of these chances and the sides were level at half time, although Ipswich still had the tie in their own hands with their home goal making the aggregate score 1-0 in the Suffolk teams' favour. The start of the second period was sloppy from Arsenal's view point. The fans wanted the players to come out of the blocks all guns blazing, but it was the visitors who pushed Arsene Wenger's men into their own area and gained an early corner. These chances came to nothing however and Arsenal survived. In the 61st minute, Nicklas Bendtner made space on the left by peeling off his defender to use the whole width of the pitch to Arsenal's advantage. Wilshere saw the Dane in acres of space and played the perfect ball for the attacker to run into. He controlled the ball, came inside his man and shot towards the far post. The effort bended around the defenders and inside the post pass Fulop to draw Arsenal level on aggregate. It was no more than we deserved. And unsurprisingly the goal came from one of many Gooners' whipping boys. Bendtner is like marmite. Gooners love him or hate him. There doesn't seem to be an in between. But he showed last night with that strike he has the quality to play for Arsenal. Steve Claridge said on Five Live prior to kick off that he shouldn't be playing out wide. Well Mr Claridge, that decision by Arsene Wenger to post the big Dane on the wing is why you are on the radio and not in football management anymore. The atmosphere was certainly lifted by the goal. Gooners everywhere knew that one goal should open the floodgates as Ipswich would need to come out and play, leaving us the space we needed to create another effort. Three minutes later Arsenal had their second. Andrey Arshavin chased the ball down on the left and forced a corner. The Russian swung an excellent ball over and Laurent Koscielny was there before Fulop to head the ball home inside the near post. To my mind, Arshavin created that goal, not just with the assist but with his chasing down of the ball. Things weren't particularly coming off for him last night, but his effort in winning that corner showed he wants to achieve something with Arsenal. With 13 minutes to go, it was the Russian who was again involved. His ball found Fabregas and the Spaniard put the ball through the Ipswich keeper's legs for Arsenal to record a 3-0 victory. Personally, I'm glad it was Arshavin and Bendtner who were the ones who scored and created the chances. Their stock among Gooners is low. But this effort shows why they are at the club. Alan Hansen on the BBC at half time said the pair should have been taken off at the break. But Arsene Wenger stuck with them. They are the whipping boys at Arsenal along with Denilson and Eboue. But they bring something to this team and that's why the manager will stick by them. So to Wembley we go. It will be our first visit to a domestic cup final since we lifted the FA Cup in 2005. And I know how dearly I will enjoy us breaking the six years without a trophy duck. We'll find out who we'll face tonight after the second semi final between Birmingham and West Ham is completed. "It meant a lot for the squad, for the team, and I must say they deserved to be rewarded because they have an outstanding attitude and spirit. They are on a natural development process and overall I think that in the last four games we scored three goals in every single game and conceded one so we are efficient on both sides. It was important to continue to believe, not to rush our game and not become nervous. We did that very well." The club have announced details of how to apply for Cup Final tickets. The manager has said that loaning a central defender rather than buying one could be the ideal solution to our central defensive problem. Whilst Craig Eastmond has left the club on loan to join Millwall for the rest of the seaon and Henri Lansbury rejoins Norwich City until the end of May. The manager says that Carlos Vela could leave the club for a loan spell sometime this week. The chairman Peter Hill-Wood has spoken about the potential signing of Alex Oxlade-Chamberlain and given an update on the fitness of Thomas Vermaelen in an interview with the Daily Star. Congratulations to Swiss defender Martin Angha who has signed his first professional contract with the club. Good luck Martin.